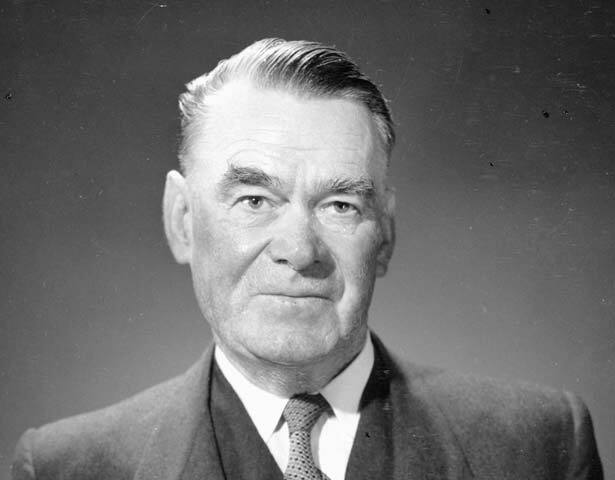 As a leading trade unionist from the 1930s until his death in 1963, Fintan Patrick Walsh established himself as one of the most powerful figures in New Zealand. His ruthless manner in dealing with opposition aroused great loathing in his enemies. At the same time the man whose dark hair and features saw him dubbed the ‘Black Prince’ inspired intense loyalty from his followers. Walsh had a physically dominating presence with oratory skills and intellect to match. He is perhaps best remembered as a controversial opponent of striking waterside workers during the bitter 1951 waterfront dispute. Walsh was a man of many names. Commonly referred to as Jack, he began life as Patrick Tuohy. He was born in 1894 in rural Poverty Bay, one of 11 children of Irish farming parents Andrew Tuohy and Hannah O’Sullivan. He had his first taste of union militancy in the United States in 1916. By 1919 he had a new name, Patrick Walsh, to which he later added Fintan. He suggested the name change was to avoid victimisation in the United States due to his trade union activities. Walsh returned to New Zealand in 1920, working as a seaman. He had a brief early flirtation with communism (he was a founding member of the Communist Party of New Zealand in 1921), but resigned from the party in 1924 and became increasingly critical of communists. He became president of the Federated Seamen’s Union of New Zealand (FSU) in 1927, a position he held until his death in 1963. As a member of the executive of the New Zealand Alliance of Labour from 1928, Walsh promoted direct industrial action in preference to political reform. Walsh’s position on arbitration and the use of political means as opposed to direct industrial action softened as a result of an increasingly close relationship with the Labour Party’s deputy leader, Peter Fraser. After Labour’s election victory in 1935, he convinced FSU members that union militancy would hurt a government sympathetic to their aims. He joined the executive of the newly formed New Zealand Federation of Labour (FOL) in 1937, and was able to secure the support of the numerically strong pro-arbitration craft and occupational unions. He was elected the FOL’s vice-president in 1946 and president in 1953. In 1942 Walsh was appointed to the government’s Economic Stabilisation Commission. Central to the government’s plans for the wartime economy was keeping wage demands in check. Workers accepted the need for wartime sacrifices but sought a relaxation of economic controls when the war ended. The government – and Walsh – disagreed. The Commission remained active until 1950 and dealt with wage demands through the centralised arbitration system. Matters came to a head at the 1950 FOL conference when a number of unions, including the waterside workers, walked out and formed the rival New Zealand Trade Union Congress. The waterfront dispute of 1951 was the biggest industrial confrontation in New Zealand’s history. It lasted for 151 days, from February to July. At its peak, 22,000 unionists were off the job. The dispute took place in a climate of Cold War suspicion. The opposing sides denounced each other as Nazis, Commies, traitors and terrorists. Walsh and the FOL sided with the National government against the striking wharfies and their allies. Walsh called on wharfies to ‘abandon their Communist-dominated misleaders’. Opponents denounced him and FOL colleagues as ‘rats who had betrayed the workers’ cause’. The Labour Party regained power in 1957, but Walsh roundly condemned its 1958 ‘black budget’ as an attack on workers. Some accused him of disloyalty and he faced increasing discontent from within his traditional power base. In 1960 he was dumped as president of the Wellington Clerical Workers’ Union, a position he had held since 1936. A number of libel actions followed as Walsh faced increasing dissent from the right of the union movement. In his last speech to an FOL conference, in 1963, Walsh spoke with the militancy of his younger days, preaching class struggle and denouncing the arbitration system. He died shortly afterwards and in accordance with his wishes there was no burial service. His grave in Karori cemetery is near Peter Fraser’s memorial. We have 4 biographies, 3 articles, related to Fintan Patrick Walsh.